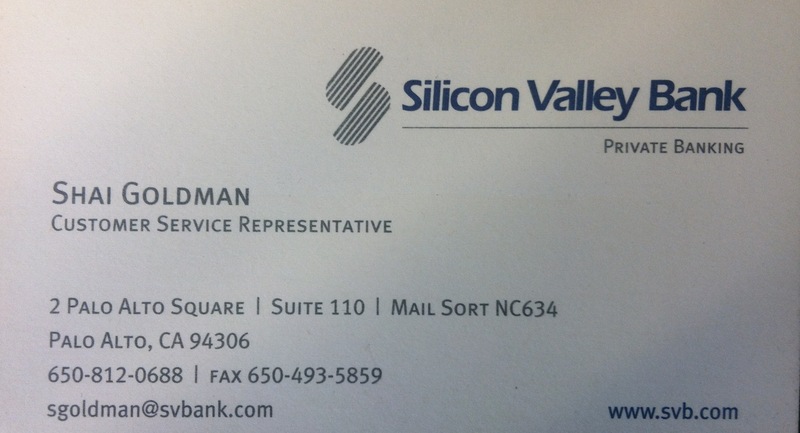 As a background, I joined SVB upon graduating from Santa Clara University, my first month on the job was November 2001. For those who recall, this was a terrible time for our country, we had the stock market collapse in March/April 2000 and was followed up by the tragic events of September 11, 2001. The Bay Area economy was in terrible shape as the market downturn impacted tech companies, which was the main driver of local jobs. There were so many colleagues that were a pleasure to work with including nine managers that I had a chance to learn from. What really got me out of bed though, was working with innovative startups and the investors that support them. The startup community (globally) is a special one and I can’t see myself ever leaving this ecosystem. Good luck Shai – what’s next? Wow. Good luck Shai! Keep in touch. Congrats on the terrific stuff you’ve done at SVB, and I’m looking forward to seeing what you’re up to next! Congrats on the terrific stuff you’ve accomplished at SVB. Excited to see what you’ll do next! Congratulations on an amazing run at SVB, Shai. I look forward to seeing what’s next for you (and dropping some passes to you in the low post soon). Shai – Thanks for supporting the Blueprint Health accelerator and overall for being a big booster of entrepreneurship here in NYC and in the Valley.